The book Royko in Love includes fifteeen pictures, but there were quite a few more that could have been included. They are collected on these pages, with comments by David Royko, Mike Royko’s son and the editor of Royko in Love. More about the book. Click on each thumbnail photo to open a larger version in a pop-up window. One of only a couple photos I have (the other is included in the Royko In Love book) of Dad from 1953, when he was in Korea with the United States Air Force. It’s also a rare picture of Dad in uniform. He was 20 or 21 years old. 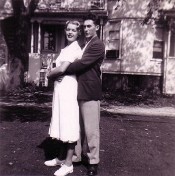 Mom’s (first) wedding day, on her eighteenth birthday, November 21, 1952. 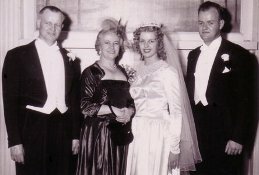 The marriage wouldn’t last long, but Carol looks happy in this photo with her parents and brother, oblivious to her close friend Mickey Royko’s broken heart. 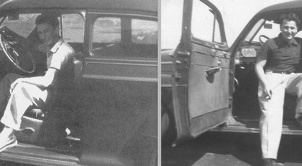 From left to right: Fred Duckman, Mildred Duckman, Carol, Bob Duckman. 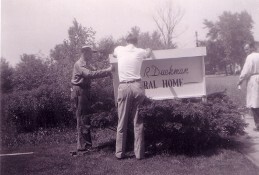 Putting up the sign: Carol’s father Fred (left) and her brother Bob (right)—who seems to be dressed in his mortician’s garb—erect a sign for the Fred R. Duckman Funeral Home. I don’t know who is helping them. 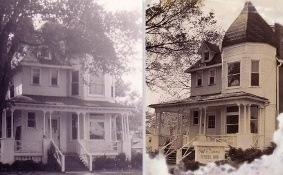 It’s striking how rural the Jefferson Park neighborhood still looked in 1950. 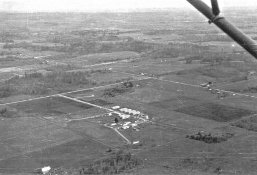 The 757th Radar Squadron—Mike’s base in Blaine, Washington, photographed from the air (a Fairchild 22) by Don Karaiskos in the Spring of 1952. Courtesy of Don “Chris” Karaiskos, here they are (Dad’s on the left) with the car they shared, in the countryside around the base. 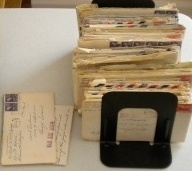 We have all of Dad’s letters to Mom, but none of her’s to him. 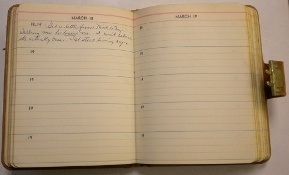 However, she did keep a diary—sporadically—during this period, and I have included several passages from it in Royko In Love. This is the diary, and her entry from the day she received Dad’s first letter to her with his huge confession. As my Uncle Bobby (Dad’s younger brother) said recently when he saw this photo for the first time, “This is a great shot and one of the most unlikely groups you would ever expect.” I myself have no recollection of ever being together at the same time with my mother’s and father’s sides of the family, which is interesting considering that my father’s niece, Barbara, married my mother’s brother, Bob! The gathering in this photo, based on the ages of the kids, very possibly took place when Dad was in town on leave from the Air Force base in Blaine, when he formally proposed to Mom. Dad probably took the picture. Uncle Bobby helped me in identifying everyone. Standing (L-R): Michael Royko Sr. (Dad’s father), Corky Ozag (Eleanor’s son), Joe Pardell/Padolski (Helen Zak-Royko’s 2nd husband), Fred Duckman (Carol’s father). 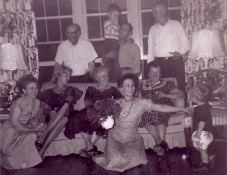 Sitting (L-R): Marie Royko (2nd wife of Michael Sr.), Mom (Carol), Mildred Duckman (Carol’s mother), Eleanor Royko-Ozag (Dad’s sister), Helen Zak-Royko (Dad’s mother and the 1st wife of Michael Sr.), Michael Ozag (Eleanor’s son). 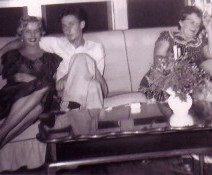 From the same gathering, Mom and Dad with his mother, Helen, and Eleanor’s son, Michael. 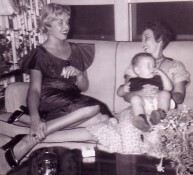 Another from the same 1954 gathering, my mother and Dad’s sister Eleanor with son Michael on her lap. With the box Mom kept them in. Mom is dressed for her job in the doctor’s office. This was taken alongside the house at 5408 N. Central, on Dad’s leave when he proposed; by his expression, you would’ve thought she said “no!” Maybe that’s what their faux-argument was about. 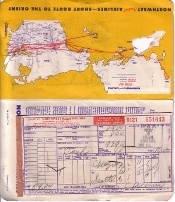 The round-trip ticket cost $97.90, which is more than $765 in today’s dollars. But at least she got a dinner, even at that ungodly hour. 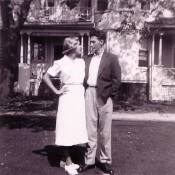 Hard to believe, but I don’t think any photos exist of Mom and Dad’s wedding or honeymoon. 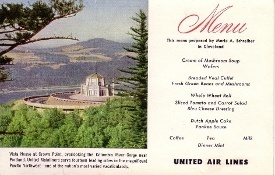 In a small box that Mom kept of wedding-related items, there is this postcard from the Lake Wilderness Lodge, 30 miles southeast of Seattle, where they honeymooned. 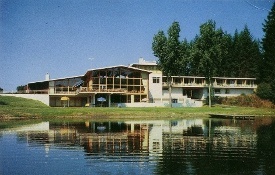 Now owned and operated (as of 2010) by the City of Maple Valley, in 1954 it was new. Tucked away in the pocketbook Mom carried when she died in 1979 was a black-and-white picture that seemed to be torn from a brochure of the same photo of the lodge that was used for this postcard, and folded with it was the dateline from a newspaper, “November 6, 1954,” their wedding day. 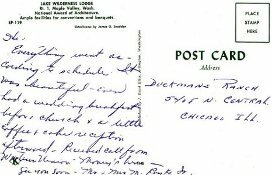 Finally, Mom wrote to her parents on the back of the postcard, but never got around to sending it, or else mailed it in an envelope. For information on purchasing the book—from bookstores or here online—please go to the webpage for Royko in Love: Mike’s Letters to Carol. Copyright: Published by the University of Chicago Press. ©2010 by David Royko. All rights reserved. This text may be used and shared in accordance with the fair-use provisions of U.S. copyright law, and it may be archived and redistributed in electronic form, provided that this entire notice, including copyright information, is carried and provided that the University of Chicago Press is notified and no fee is charged for access. Archiving, redistribution, or republication of this text on other terms, in any medium, requires the consent of the author and the University of Chicago Press.